Hi everyone! Today I’m making a sweet little woodland cake in buttercream, featuring a birch tree stump cake! 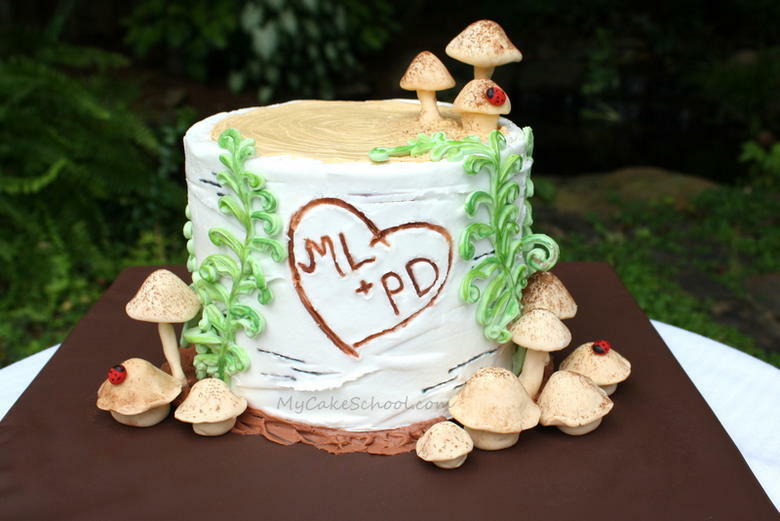 This sweet woodland themed cake design is perfect for anniversaries, wedding showers, and on a larger scale, even weddings! It’s a woodland cake in buttercream. I started with a two layer, 6 inch tier. I wanted to go with a birch tree stump so that I could keep it mostly white. I frosted the cake with our Classic Vanilla Buttercream tinted with copper coloring on top. 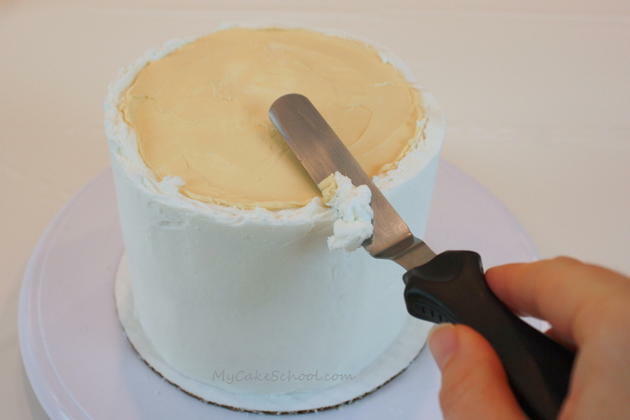 I then spun my cake on the turntable as I sliced of the excess icing around the top, holding my spatula nearly parallel to the top edge. 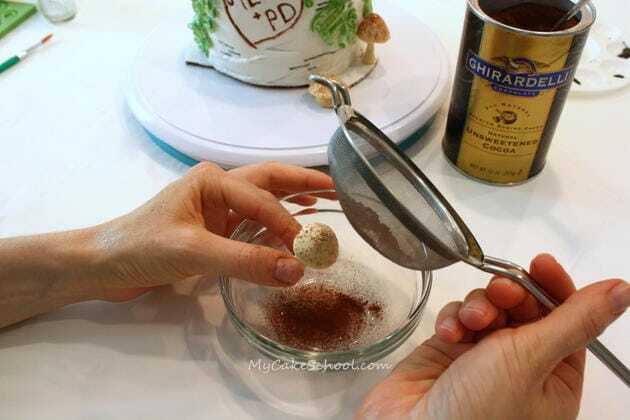 You do not have to use a crusting buttercream though for this cake–as you can see, I did very little smoothing! I wanted to keep it realistic. Next, I added lots of rings on top of our stump cake with my toothpick. I used a heart shaped cookie cutter to create an impression on the front side of our stump. Since I’m going for a carved look, I used a piping bag fitted with a tip 3 (and filled with buttercream tinted chocolate brown) to trace over the heart impression that I made. 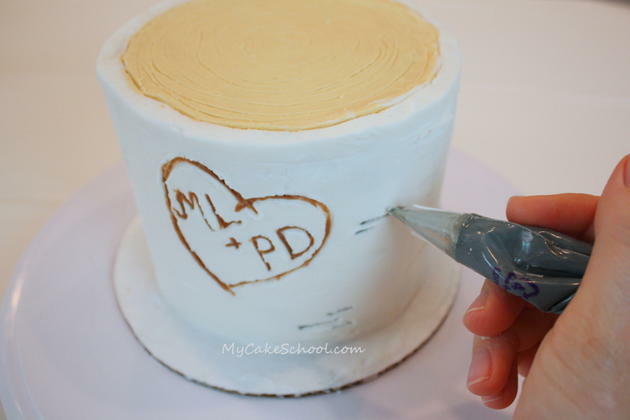 I did something that I never do–I allowed the piping tip to scrape across the surface of the icing (ack!) — but, totally necessary for the look. I had to stop and wipe off the piping tip every so often so that things wouldn’t get too messy. Birch trees are white with thin grey/black markings. I fitted my piping bag with a tip 2 and filled with grey/black buttercream (tinted with Americolor Black). Just as with the writing, I slightly buried my piping tip in the white icing as I piped. I also used my toothpick and knife to make random impressions in the bark. We’re looking pretty good at this point but we need some woodland accents…bring on the mushrooms and ferns! Since I knew that I wanted some thin-stemmed mushrooms, I decided to cut away most but not all of my cardboard cake circle. This is so that I could use a toothpick to punch holes here and there so that my mushroom (anchored with a toothpick) could fit into it. 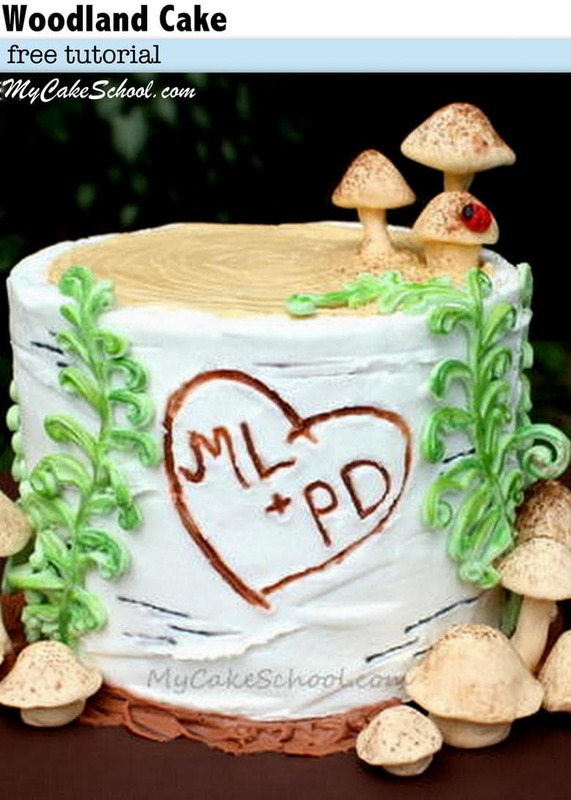 If larger stand-up mushrooms are in your plan, use two stacked cake circles as your cake base so that you can have slightly longer anchors. 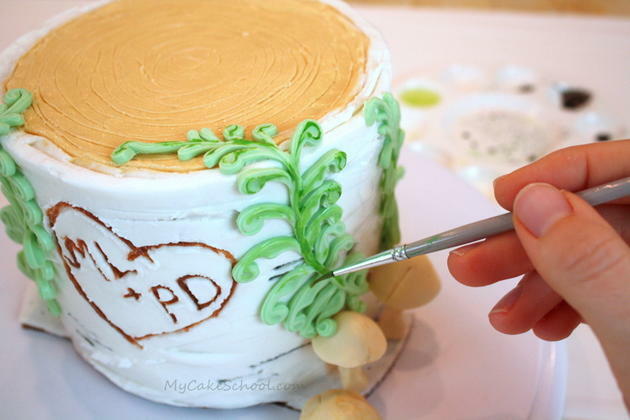 For my taller mushrooms, I formed the fondant stem around a toothpick. I left a little bit of the toothpick exposed on both ends. I kneaded a little bit of tylose into my fondant (which was tinted with Americolor Copper coloring) so that it would firm up more quickly and be easier to work with. 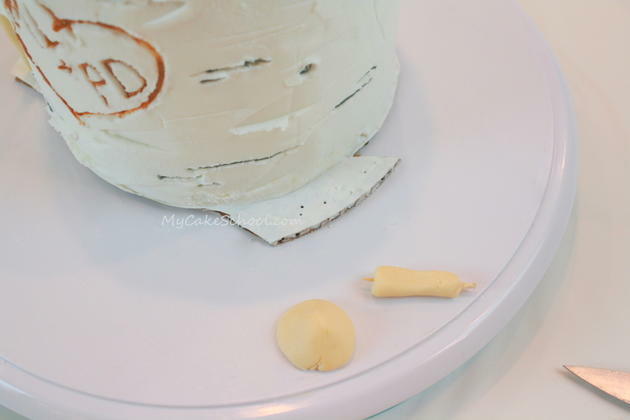 If your fondant is too soft, you may need to allow it to dry for several hours. Since mine was firmer, I was able to use it almost immediately. 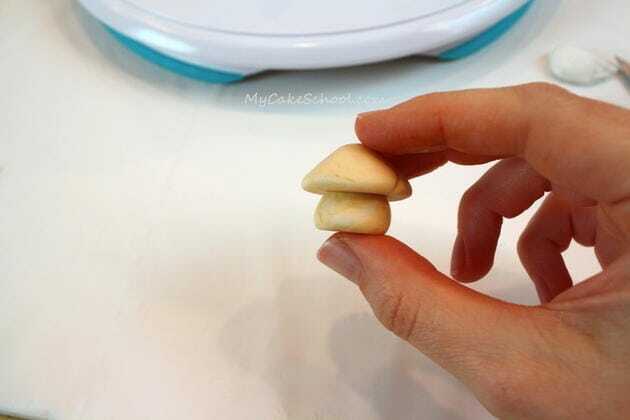 For easy, ready in an instant mushrooms, go squatty style! The stem is just a ball of fondant, flattened slightly on top and bottom. No anchor required! Next, let’s move to the ferns. 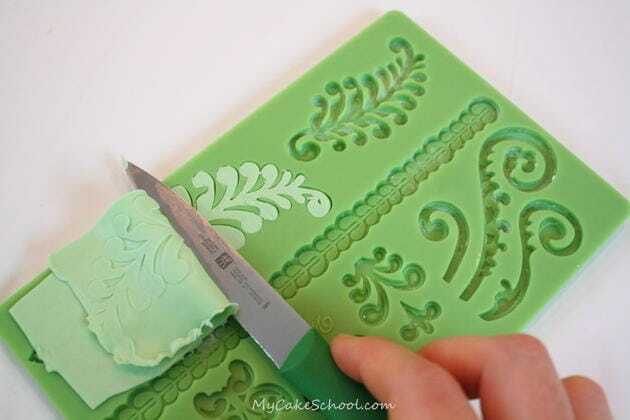 I bought this Wilton fern mold on impulse a couple of months ago and was so excited to have an excuse to use it! I dusted mine with a little cornstarch (and then wound up needing to brush just the slightest bit of shortening.) It worked great. 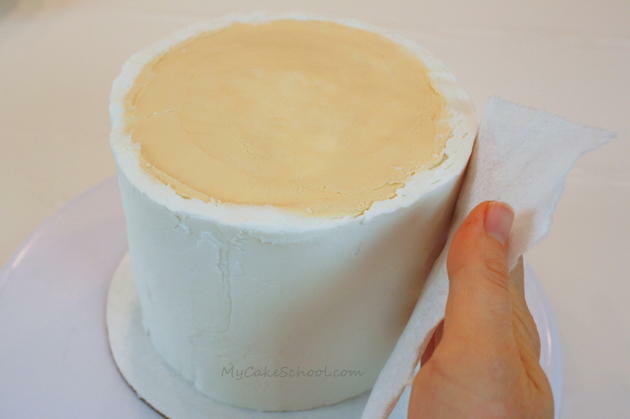 I just rolled my fondant (with a little tylose kneaded into it) over the mold. I rolled it very thin, until I could see the fern shape from the other side. 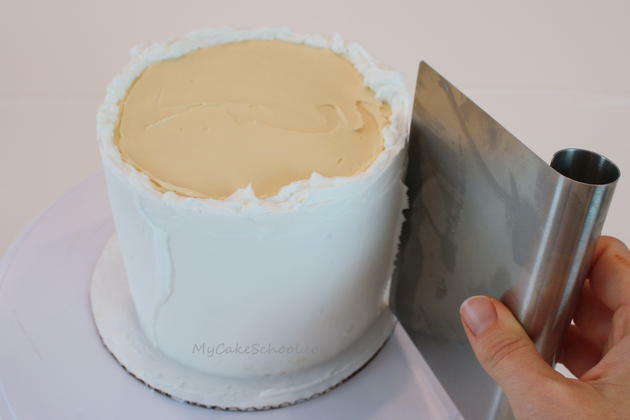 Then, I took a very sharp knife and holding it flush against the mold, I cut away the excess. My fern color was a combination of leaf green coloring and a very small amount of brown coloring. I applied the ferns to the cake immediately. Then, I added further detail with a paint that I created on my artists palette with vodka mixed with a little leaf green, a little Americolor Electric Green, a little Americolor Chocolate Brown, and a little Americolor White. I added a few tiny red fondant ladybugs (head and dots colored with an Americolor Black pen). 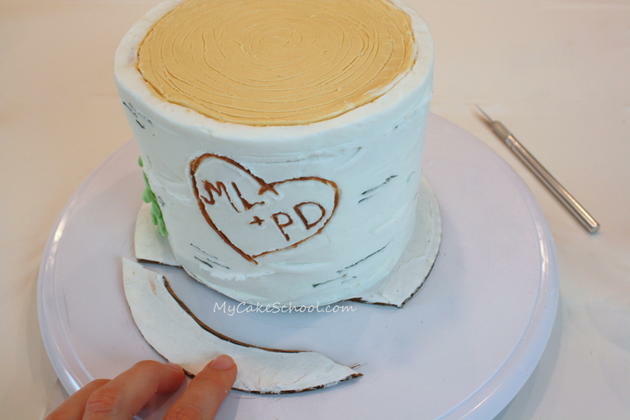 This sweet buttercream birch tree stump cake is simple but so charming! You could make it on a much larger scale in a tiered cake design for birthdays or even rustic weddings! We hope that you enjoyed the tutorial! 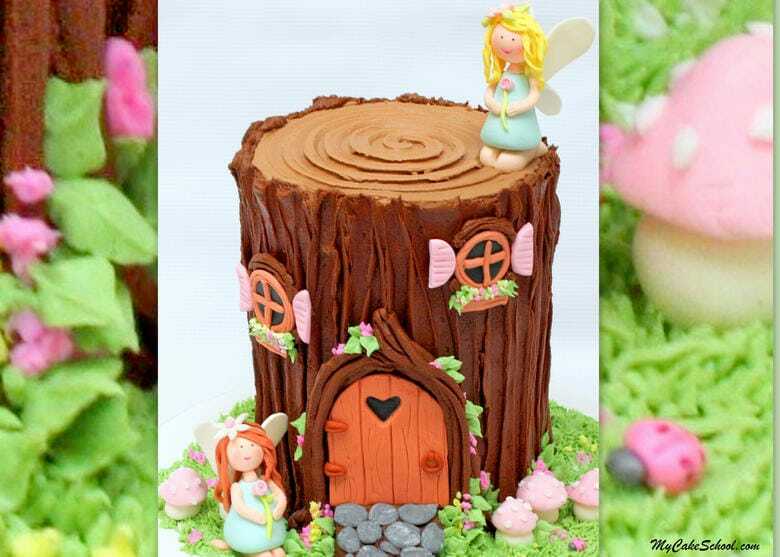 If you are looking for inspiration for fairy themed cakes, we have a CUTE Fairy House Tree Stump Cake video tutorial in our Member Section. This cake is largely frosted in chocolate buttercream, with fondant and gum paste accents. 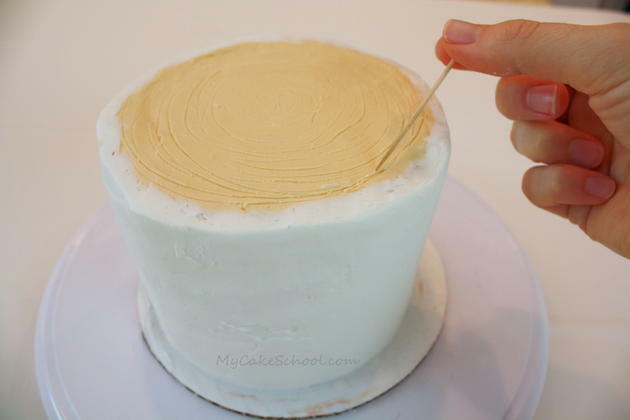 However, this birch cake tutorial would work great for fairy cakes also! It just needs a sweet little door and a window or two! Don’t forget to check out our full collection of favorite cake and frosting recipes in our Recipes Section! 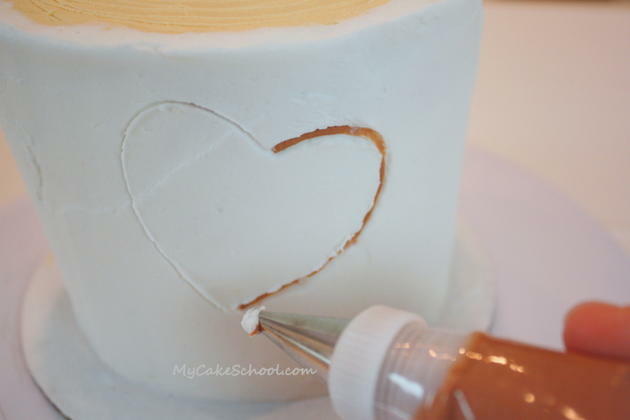 Also, our Free Tutorials Section is filled with all sorts of fun and simple cake decorating ideas sorted by category! If you are interested in gaining access to our complete cake video library filled with hundreds of cake tutorials, make sure to visit our Join Page for more information. Memberships are only $30/year and give you access to our entire cake video library! We would love to have you. Thanks for stopping by the blog today, we hope you’ll come back again soon! We are so happy you found it helpful!! 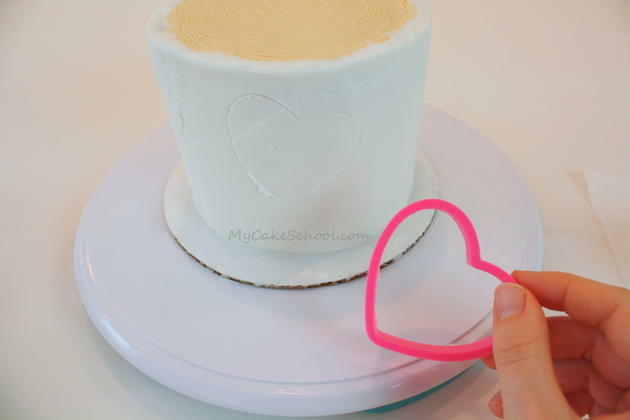 Have fun making your daughter’s cake, it is wonderful that you can do that for her.